The Hawai'i Maritime Center, at Honolulu Harbor, pays tribute to Hawaii's seafaring history, from ancient surfing to the glory days of Matson liners. Master waterman Tommy Holmes had a dream, and he generally didn't let reality get in the way. 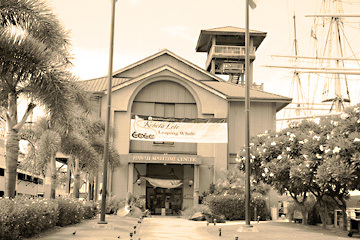 In this case, it was a world-class maritime museum in the heart of Honolulu's waterfront. Holmes managed to acquire pier space, a building -- in the form of King Kalakaua's boathouse -- and a number of free-standing and floating exhibits -- including the marvelous Falls of Clyde oil clipper -- and had it up and running in the amount of time other museums are still having committee meetings. Holmes passed away while still director of what was called the Hawai'i Maritime Center, next to Aloha Tower, and the site later merged with Bishop Museum, which then became the only museum in the world with TWO full-sized hanging whale exhibits. The center also became a home for rotating exhibits and conferences, as well as a seafront restaurant. In addition to Falls of Clyde, the Polynesian Voyaging Society canoe Hokule'a has pride of place, which is only natural -- Holmes was a founding member of the society. On the other side of the pier, the state had hoped to berth the last surviving Pearl Harbor warship, the USS Hoga, but the U.S. Navy instead awarded the historic tugboat to a spot alongside the Clinton Library in Arkansas. Before you ask, the pier is too short for the USS Missouri. Inside the museum are exhibits covering ancient Polynesian voyaging, the Honolulu waterfront, ancient surfing, the glory days of Matson liners and Pan Am's giant flying boats. Open 8:30 a.m. to 5 p.m. daily. Admission is $7.50; children 6-17 $4.50, under 6 free; military and kama'aina rates available. Information: 523-6151.